Post Traumatic Stress Disorder was once thought to be a military disorder reserved for those who experienced traumatic events on the battle field. 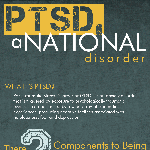 As this infographic illustrates, PTSD is much more common in today’s society than you may think. The infographic shows that one in three pregnant women develop symptoms of PTSD and 5% of adolescents aged 13-18 have met the criteria for PTSD. The Billion Dollar StartupsWhich UK Retailers Have Been Hit The Hardest By The 2012 Recession?